Hungarian is a member of the Finno-Urgic family of languages. It is distantly related to Finnish, but is most closely related to Khanty and Mansi (which each have a few thousand speakers). Effectively, Hungarian is an isolate in Central Europe and unrelated to the Slavic, Germanic and Romance languages spoken in neighboring states (all of which are a part of the Indo-European language family). This make Hungarian a difficult language for a native English speaker to learn. So why, you may ask (as others have) am I learning it? First, it is a very interesting language---at least to somebody who is used to languages that have SVO word order, lots of prepositions, and grammatical gender---all pretty much absent from Hungarian. Second, some of my ancestry is Hungarian, and I became interested in speaking it since finding some information, in Hungarian, about a possible relative. Finally, as I learned more Hungarian I found more I wanted to learn. An unfortunate side-effect of being a language isolate is that little gets translated, and much of that selectively. Pointers to information about Hungarian. Hungarian Language and Culture Courses at the Debrecen Summer School. Hungarian Language Page A brief introduction to Hungarian. Hungarian Language Puzzles, Tips, Sound Files A more advanced Hungarian course. New paths to the Hungarian Language Audio recordings, news articles, grammar and vocabular exercises, news forums and more. An excellent collection of resources for learning Hungarian. English-Hungarian Dictionary Also a Hungarian-English dictionary. Math Love Poem by Stanislaw Lem In the Polish original, English, German and Hungarian. Selections from The Cyberiad Also by Lem and also in Hugarian. The poem below is taken from this link. More poems by Petõfi Sándor, Arany János, and others. (And, links to A Simpsonék és Futurama). Endre Ady A late 19th, early 20th Century Hungarian Poet. One of the many reasons I wish to learn Hungarian. Corvina Books, Ltd., Budapest, Hungary, 1997, 2000. Hippocrene Books, New York, 2001. Beginner's Hungarian in 10 lessons. Each lesson starts with a dialog in Hungarian, followed by the English translation and new vocabular terms. Next comes a grammar lessons, and exercises. A comprehensive vocabulary (indexed to lessons) and exercise solutions are included in the final chapters. Introductory material on Hungary and Hugarians completes the book. This is better used as a graded reader than an introductory book. Unless the reader is very good with languages, the material will be too difficult to absorb. The book also tries to be too much in a short 168 pages. Instead of the introductory chapters, I would rather see more dialogs and grammar. But, as a graded reader for somebody already familiar (but not conversant in) Hungarian, this is a good book. Watch out for typos, especially in accented words. Teach Yourself Books, Lincolnwood Illinois, 1993. Book plus two tape cassettes of exercises and pronunciation drills. Emphasis on dialog and conversation, and includes some background information on Hungary and Hungarian customs. The book introduces new terms in dialog, encouraging the reader to infer their meaning. Later vocabulary lists provide sufficient meaning for exercises. Carol H. Rounds and Erika Sólyom. Routledge, London and New York, 2002. Carol Rounds is the author of an excellent Hungarian grammar book for Anglophones. This book is an introduction to Hungarian, based on graduated dialogs. The grammar and usage are introduced as dialog progresses. I like that many usages are introduced in context, allowing grammar to be seen, and practiced before formal rules are introduced. This is the best intro book I have found so far. Tamás Magay and László Kiss. NTC Publishing Group, 4255 West Touhy Avenue, Lincolnwood, IL, 1996. It is good to have both a small dictionary, for carying with you, and a large dictionary for more detailed references. The former is a small, paperback travel dictionary. NTC's dictionary is more robust. Helen Davies and Helga Szabó. Holnap Kiadó/Usborne Publishing, Ltd., 1111 Budapest, Zentu u. 5., 2000. A picture dictionary, with a brief introduction to grammar. Learning hungarian vocabulary is difficult, since most words are unrelated to Latin, or any other Indo-European language. Any and all tricks to expand vocabulary are fair. Passport Books, NTC/Contemporary Publishing Group, 1997. A concise guide to, as it says, Hungarian verbs and grammar. Good for technical details, verb forms, vocabulary lists. Not very good for conversational Hungarian. The book does not deal with pragmatics (what is appropriate for a situation), but is more detailed than Pontifix, and, despite the sparse index, makes a better reference. Debreceni Nyári Egyetem, Debrecen, 1999. The University of Debrecen teaches an intense Hungarian Lanugage course (which I would like to attend some day). They have written their own instuctional materials, and this is quite an interesting grammar book. It explores hungarian in more detail than other grammar books I've read, including sections on dialects and regional prononciation. This grammar book was written by a native speaker of English, and so I find it to be extremely helpful. There are many places where the Hungarian case system, for example, does not map well to English prepositions. Rounds explains the mapping in detail, with many examples. My one complaint is she starts some chapters with the exceptions, which can be confusion. And, there are a few errors that proof reading should have caught. If you speak English and are learning Hungarian get a copy of this book! Perhaps Hungary's best known, and certainly most widely translated, historical novel. 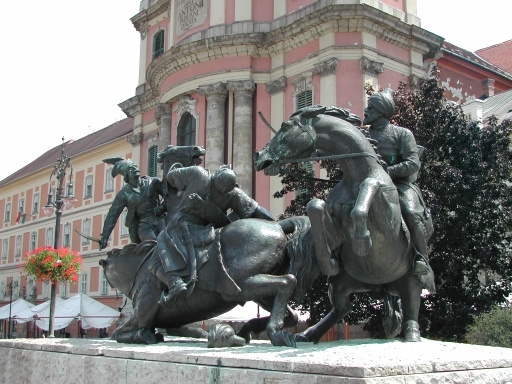 Ergi csillogok is about the defeat of 40,000 Ottoman Turks by István Dabo and the 2,500 occupants (men and women) of Eger Castle in 1552. Gádonyi is buried on the grounds of Eger Castle. The inscription reads ``CSAK A TESTE''---Only the body. Ergi csillogok translated into English with an introduction by George F. Cushing. World verses: A collection of poems by Ady. Hungarian translation of H.P Lovecraft's novela The Lurker at The Treshold, and three short stories. Translation by Jánosházy Gyögy, 1983. I love Lovecraft, so although this is a very difficult book to read in Hungarian (many long, descriptive Lovecraftian sentences) it is fun to try. Get a good dictionary first! I was sent this a long time ago.... (See above). Kóbor kaffer kószál királylány kertjében. Királylány kacéran kacsint kéjvágyó kedvében. Katonák! K�rtszó, kivégzés. Királylány kacag kuszán. Kegyetlen kor! Kicsapongó, koronás kurtizán! Coy creature carelessly charmed caffre creating churning covetousness clan. "Citizen! Commence comeuppance!" Coquette cackled confusedly cockeyeing. "Callous cycle!" condemned caffre, "caustic cheap charmer cosmopolitain!" If it isn't obvious by now, I am also a Stanislaw Lem fan.